The original and best grouphead cleaner NSF Certified. 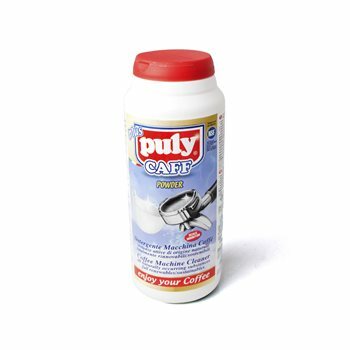 Use Puly Caff powder to backflush your machine and remove residual coffee oils that build up behind the shower screen and in the grouphead. You should backflush your machine every day first thing before opening for business. Dissolve some Puly Caff in warm water and soak the filterholders and filter baskets overnight and rinse in the morning before use. We import Puly Caff direct from Italy, it is the world’s number one coffee cleaning powder. Cleaning your machine on a regular basis will help with the consistency and standard of your coffee offering and ensure a longer life for your machine.